Teddies are an essential purchase for all nursery rooms and also represent a large share of the new baby gift market. As a prime wholesaler to the nursery industry, Baby Brands Direct prides itself in stocking a variety of soft toys suitable for various stages of a baby's development. 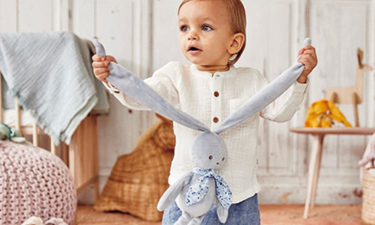 As a nominated distributor for leading brands including Fisher-Price, Lamaze, Peter Rabbit, Little Bird Told Me and Keel Toys, we are able to offer a huge range of quality plush toys. Our clients can select from: ring, bean, squeak & body rattles, activity plush toys, Disney character large toys, comfort blankets, linkable loop toys, audio & light soothers, ragdolls & plush dolls, musical plush toys, licensed character plush toys and nursery teddies. Plush toys and activity items are high in demand as they play a crucial role in the educational process. Toddlers get attached to dolls, puppets, and stuffed animals as they teach them important skills. Retailers can shop at convenience with our unparalleled selection while benefiting from our competitive wholesale prices.